England's humiliating defeat against Australia in the fourth test at Headingley has had a knock-on effect for the Yorkshire venue, and its conference and hospitality division, the Headingley Experience. Some 1,500 corporate hospitality delegates had been expected to attend play in Leeds today, but without any cricket to watch, around half of these will not now turn up. "Despite the match finishing, we're still expecting around 750 people to turn up today for lunch with no cricket," said Headingley Experience spokeswoman Sam Khan. Nobody was available to comment on the financial implications of the cancellations. In terms of ticketing, those cricket fans who purchased tickets for the fourth day's play will receive full refunds, while people who bought non-refundable fifth day tickets will not get any money back but they will, however, be able to use their tickets to attend a Yorkshire county match. 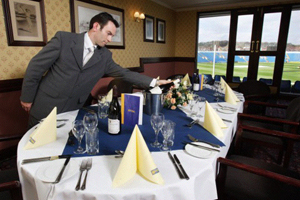 Headingley Experience offers a variety of event spaces, the largest of which, the Premier Suite is set in the pavilion's top floor and can seat 250 theatre-style.